Malvern (Worcestershire, England) is my home town, I grew up here and have now returned, after over 30 years living in London and then Horsham. Events in Worcester, Cheltenham, Hereford and Birmingham, and superb venues like Bilston Robin 2, are all easily reachable from here. I have included a page of photos of flowers and plants in my garden here in Malvern in 2013. I often call in at Cafe in the Green for a late brunch before doing my shopping on Saturdays or weekdays if I'm on leave. Great locally-produced food, and very handy for the good range of shops in Barnards Green. The White Feather Collective are a great Surf/Psych/Rock band from here who play across southern Britain and are always a hit with local audiences - their last gig at West Malvern Social Club sold out so quickly they arranged another for the following night! Malvern is privileged to have been adopted as the home town of US expatriate Tyler Massey. A talented singer/songwriter and guitarist, he devotes a great deal of energy into ensuring we have a 'happening' music scene here, such as by running open mic sessions at venues such as WMSC (see below) and by giving guitar lessons. He has recently released a great EP American Nightmare with five superb songs on it. 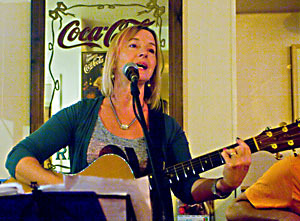 Carol Lee Sampson is a very talented Malvern singer/songwriter. She has recorded a number of CDs and frequently plays bluesy gigs with her CLS Country Blues Band. Flatworld are a lively Malvern folk band who play songs that combine French and East European styles. Jack of All are a Folk/Punk trio with an ever increasing stock of original material. Some soulful, some snarling but all from the heart, and mostly more tuneful than the label "Punk" would tend to suggest. Their sound is built around Laurence Aldridge's powerful vocals and Anna Mcloughlin's electric fiddle, combined with a shared social conscience and former Spiralize member Eric Hej's great drumming. Sundara are an acoustic collective, led by Madhava Norton and featuring the very talented former Spiralize singer Liz Pearman, fusing Indian melodies with folk music to create a unique combination of conscious lyrics and mantra sound vibration. Their songs convey a level of warmth that I find rare in other contemporary music. Journeyman are another super Malvern folk/rock and covers band. The Celluloid Band continue to push musical boundaries with their own unique sound. I took several sets of photos of Spiralize (right), whose colourful performances combined flowing energy with wonderfully sesnuous singing and playing. A great friendly bunch too! They're, sadly, no more, so I keep the pages as a tribute and so others can enjoy seeing how they were. I also ran the official website of erstwhile Malvern band Headhunters, an incredible dance sound on authentic instruments. 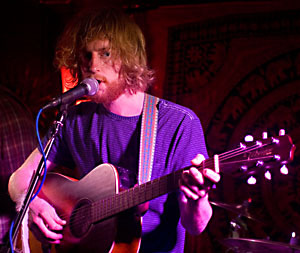 Includes photos of a great night headlining the Avalon stage at Glasters! Related band Suns of Arqa also have many connections with Malvern. 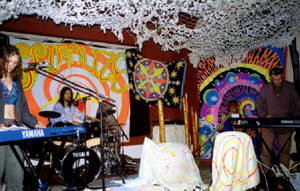 Brazilian celtic rockers Ashtar headlined the first ever rock gig on the Priory Park bandstand on 27/5/05 (right) after I had recommended them to organisers Floating Lotus. Mother earth blessed us with weather we could not have dreamed of - the hottest May day since 1953 - and a great time was had by all. Ashtar returned to play another great gig at Malvern Youth Centre on 29/7/06. Kington band Mermaid Kiss were well received at the Great Malvern ("Con") Club on 24/4/04. 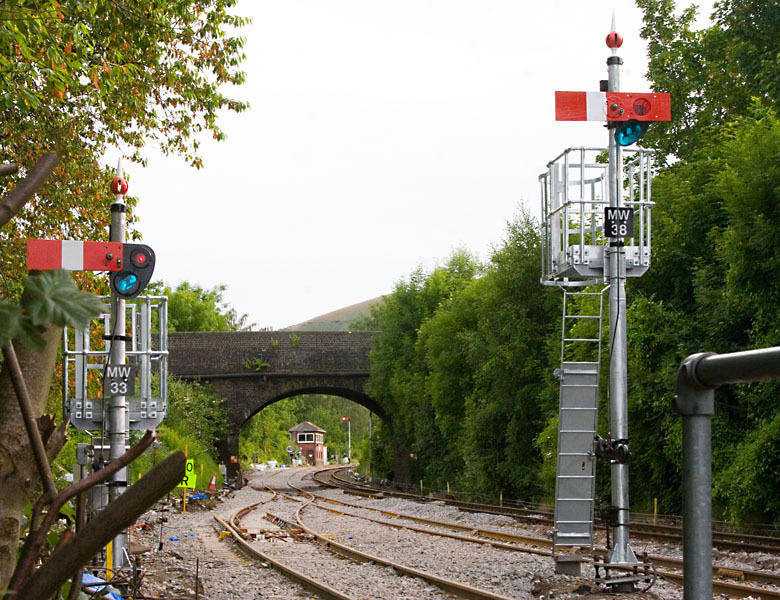 I have included a page of Malvern Wells signal photos in the Railway Signalling section of this site. 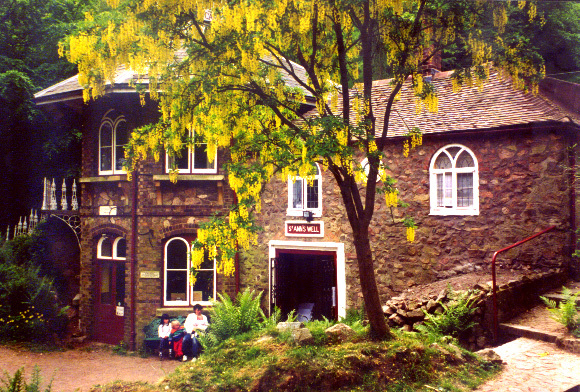 My grandfather was the stationmaster at Malvern Wells for a number of years including the whole of World War II. The station there closed in the Beeching rationalisation of the 1960s, as the other two stations at Malvern Link and Great Malvern are better placed to serve most of the town. But the signal box still remains at Malvern Wells because this is where the double-track line from Worcester singles before going through the Colwall and Ledbury tunnels. The railway line runs alongside the Wells Common on its approach to Malvern Wells from Great Malvern. This is another very pleasant place to go for an afternoon or evening stroll, though the side of the railway line is now pretty overgrown compared to how it was when I was a kid. Nearby Worcester now has one of the best remaining collections of lower-quadrant signals too. West Malvern Social Club is a great venue for smaller bands' live gigs and also hosts superb Open Mic sessions every Thursday evening and music sessions on Sunday nights. West Fest is a great July one-day outdoor festival of local music and other arts - Malvern's mini Glastonbury! - held each summer in West Malvern. MappFest is a great two-day free festival held on the Malvern Link Common each June, providing great entertainment while raising funds for a number of local charities - and it's just five minutes stroll from my front door! There is also a MappFest community page on Facebook. Malvern Rocks is our equivalent of the Edinburgh Fringe Festival, with gigs and performances arranged at many of Malvern's venues each August. allaboutmalvernhills.com is a free online guide to what's on in the Malvern Hills area. Floating Lotus organise marquees and also sometimes gigs and other events in Malvern. Malvern Fringe also organise cool entertainment in and around the town. Hills Arts has a great listing of all kinds of arts in the Malvern area, particularly music, song, dance and healing. Malvern Theatres run the arts centre complex in Grange Road (the successor to the former Winter Gardens). Two excellent music venues in nearby Worcester are Huntingdon Hall - a converted church that has retained almost all of its original decor - and The Marrs Bar, which caters for local and alternative bands. Two further talented musicians here - (Martin) Thorne and Mason make Solidair Lapslides - unique musical instruments not too dis-similar to dulcimers. Slap Magazine (Supporting Local Arts & Performers) is a free printed and online gig and event listing magazine that's distributed throughout Worcestershire, Herefordshire, Gloucestershire and Warwickshire. For those like me that love plants and flowers, the Royal Horticultural Society runs annual Spring and Autumn Gardening Shows at the Three Counties Showground near Malvern. I had a good day at the spring show 2002, I managed to get one of my favourite candelabra Primulas. Friends of Malvern Railways are a subgroup of the Malvern Civic Society who care about Malvern's railway infrastructure, particularly the buildings and structures, and work with the rail companies and local councils to promote good maintenance and restoration in keeping with the town's heritage. Malvern's Lost Railway is a great historical photo gallery. Though it's main focus is the former Midland Railway line from Malvern to Ashchurch, it also has pages featuring Malvern Link and the former Malvern Wells (GWR) stations. Malvern Community Forest is a volunteer organisation creating and managing woodland areas for the enjoyment and benefit of local residents and the environment. They are now leading the project to establish woodland, hedgerow, bumblebee/pollinator and tree-fruit areas as mini-nature reserves and community environmental resources in the peripheral areas at Malvern Link station, with collaboration and assistance from Friends of Malvern Railways and London Midland Trains. They also run the Abundance Malvern scheme, in which volunteers collect or pick garden fruit that's either surplus to the owner's needs or impractical for them to pick themselves and donate them to good causes. We gave them some of our Bramley apple crop in 2015. Malvern Hills AONB has a lot of useful information about the Malvern Hills Area of Natural Beauty, including an interactive map that allows you to zoom in to considerable detail. Malvern Hills Springs and Wells is a useful site compiled by the Friends of Malvern Springs and Wells, giving lots of detail about the various Malvern Water springs around the hills. This is Malvern is a useful compendium of news, events and services in Malvern. It's run by Newsquest Media Group, who also publish Malvern's local (weekly) newspaper, the Malvern Gazette. I handed over the Malvern Museum website some years ago to others with more time to do it full justice. An interesting independent page, though now somewhat out of date, is the Knowhere Guide. Relevant local authority sites are the Malvern Town Council, Malvern Hills District Council, Worcestershire County Council and Herefordshire Council. Another useful sites is www.herefordshire.com.